Police Fatally Shoot Black Security Guard Who Detained Shooting Suspect A police officer arriving on the scene shot and killed Jemel Roberson, a uniformed security guard who had detained a suspect after a shooting in a suburban Chicago bar. 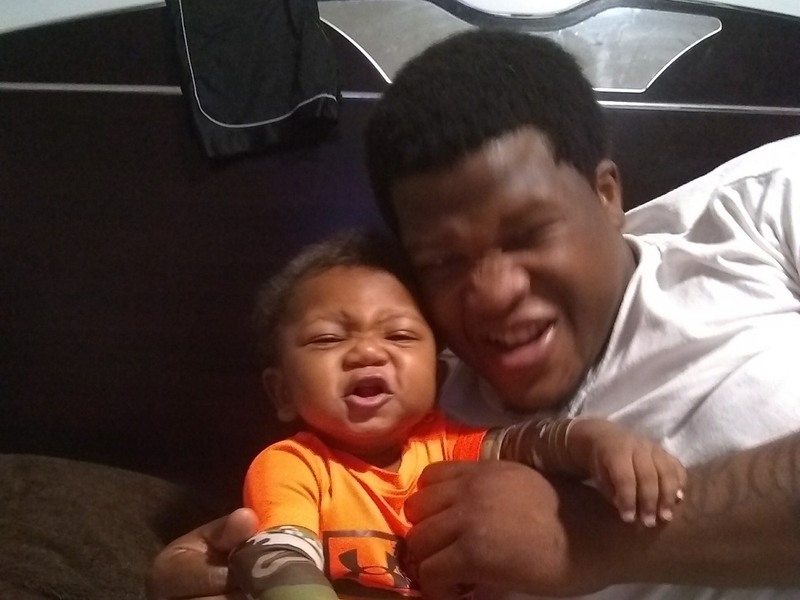 Jemel Roberson and his 9-month-old son. Adam Harris, who was at Manny's Blue Bar in Robbins at the time of the incident on Sunday, told WGN-TV that Roberson was holding "somebody on the ground with his knee in his back, with his gun in his back" when officers from neighboring Midlothian got there early Sunday. Midlothian Police Chief Daniel Delaney said that's when one of his officers "encountered a subject with a gun" and shot him, according to a statement given to the media. But the "subject" was Roberson, not the suspect in the bar shooting. On Tuesday, Illinois State Police issued a statement saying that "a Midlothian Police Officer encountered a subject in plain black clothing with no markings readily identifying him as a Security Guard, armed with a gun in the west parking lot." "According to witness statements, the Midlothian Officer gave the armed subject multiple verbal commands to drop the gun and get on the ground before ultimately discharging his weapon and striking the subject," the statement said. Roberson was holding a firearm he was licensed to carry. Other witnesses, and a lawsuit filed by Roberson's family, reportedly said he was wearing a hat emblazoned with the word "security." "Everybody was screaming out 'Security!' " Harris told WGN. "And they still did their job, and saw a black man with a gun, and basically killed him." Another witness, Jakia Woods, told member station WBEZ's Miles Bryan that Roberson was wearing an orange vest and the hat marked "security." She said it was "absolutely clear" that he was a security guard. Woods said that the Midlothian officer came out of the club's back door — weapon drawn — and ordered Roberson to "get on the ground." "Before he says 'ground' he fires the first shot," she said, adding that she has not been interviewed by investigators. Roberson was declared dead shortly after arriving at a hospital. Four others at the bar, including the shooting suspect, sustained non-life-threatening injuries, police said. Delaney said that the Cook County Sheriff's Office and the Robbins Police Department were investigating the shooting. Roberson was the father of a 9-month-old son. "This was going to be my baby's first Christmas with his dad and now he's going to miss out on everything," Avontea Boose, the child's mother, told The Associated Press. Roberson was also a musician for churches in his community. "Every artist he's ever played for, every musician he's ever sat beside, we're all just broken because we have no answers," the Rev. Patricia Hill told WGN. She added that Roberson had dreamed of being a police officer. "He was getting ready to train and do all that stuff, so the very people he wanted to be family with, took his life," Hill said. Roberson's family filed a lawsuit on Monday against the Midlothian police department and the officer who shot him, seeking damages of $1 million. A GoFundMe page has been established to raise money for funeral costs. Family and friends held a vigil Monday evening at the nightclub where he was killed.